The stone panels are displayed in the crematorium waiting room. 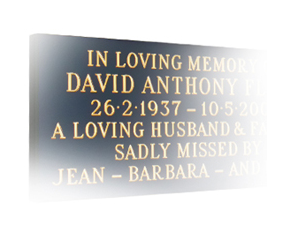 They are made of Welsh blue/black stone and we have two sizes of panel available – single and double. The image on theis page shows a double panel. The lease of the panel is for 5 or 10 years and you have the option to renew at the end of this period. Flowers may be placed in a vase at the foot of the wall, but nothing may be placed on the panel itself as it may damage the panels.